Download Enigma Recovery for Windows (link) or Mac (link) from the correct download button above that indicates your computer or laptop’s operating system. Then follow the instructions given to install the software. 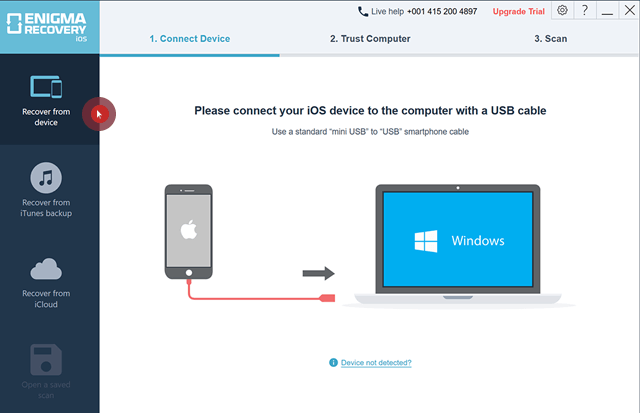 Launch the software and select ‘Recover from iTunes Backup file’ – for this step it helps if you leave your iOS device disconnected from your computer, as the software will automatically recognise it and start scanning the device. The software will display a list of all of the iTunes backup files that have been found in the default iTunes backup folder on your computer. Choose the backup file you would like to recover from and click ‘Next’. We recommend that you choose the file with the most recent date to recover your most recent data in the backup. 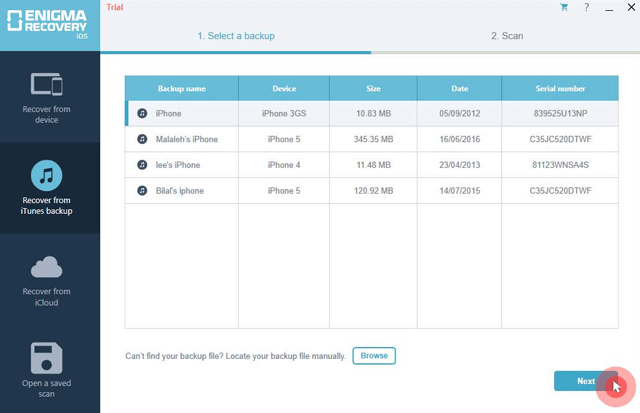 If the backup that you are searching for does not appear in the software interface, it is possible that your device has not been previously synced with iTunes, or the location of the backup has been changed by you or another user. If you know the location of the file that you need to recover data from, you can click on the ‘Browse’ button to search your computer for the iTunes backup file in a different location. 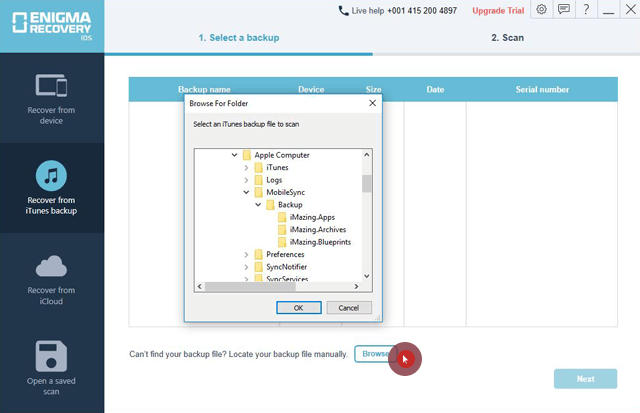 Once you have found the file you need, click ‘Next’ and wait while the software scans your backup file for data. The next step Select the types of data you would like to recover from the backup file, or ‘Select all’. 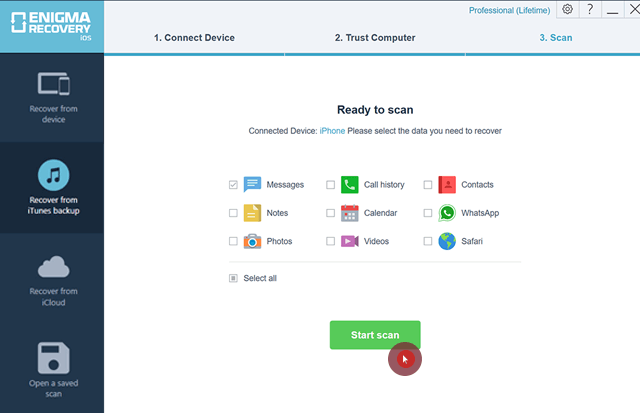 Now click ‘Start scan’ and the software will scan your iPhone backup file, to retrieve your lost data. Once the software has completed the scan of your iTunes backup file, you will be able to view your data that has been found, by clicking on each data type that you selected for recovery. If you are using the free trial of the software, the data displayed will be a preview of all of the extracted files from your backup. 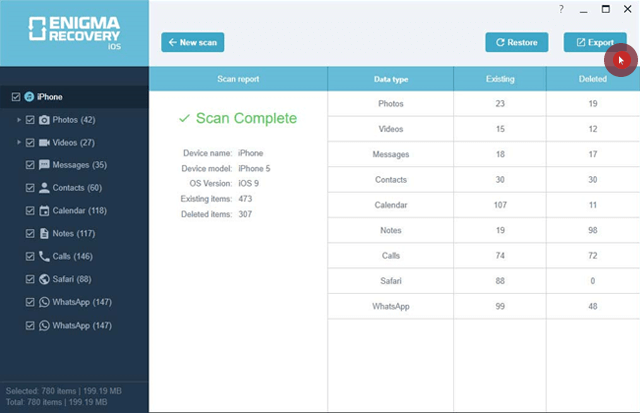 To recover and view all of the files, as well as gain access to the export and restore features of the software, purchase a license key to upgrade your software to the full version. You can export and save files to your computer with the full version of Enigma Recovery. To export files, tick the data you wish to save and click ‘Export’. Now select ‘Export selected data only’. Next, choose the location to save the files in, and hit ‘Export’. Still struggling to find the data you need from your iTunes backup file? Get in touch with us by emailing [email protected] or start a chat with our support team by clicking on the Messenger icon in the bottom of the screen. Our team is here to help you, so you never have to worry about lost or deleted data again.